The trail follows the former Chicago and North Western railroad corridor and winds through the hill country and wetlands adjacent to Highway 18-151. From Dodgeville to Mount Horeb the trail follows the top of the Military Ridge, the divide between the Wisconsin River watershed to the north and the Pecatonica and Rock River watershed to the south. East of Mount Horeb to Fitchburg, the trail cuts through the Sugar River Valley. Although a large portion of the trail is wooded, users have many beautiful views of the hills and valleys that radiate from the ridge. The pastoral trail borders the southern boundaries of both Governor Dodge State Park and Blue Mounds State Park. This portion the trail is blacktop. Although it closely parallels Highway 18-151 the trail cuts through some nice wooded areas, wetlands and grasslands, farmed fields, and neighborhoods, and even includes a free little library and bench. 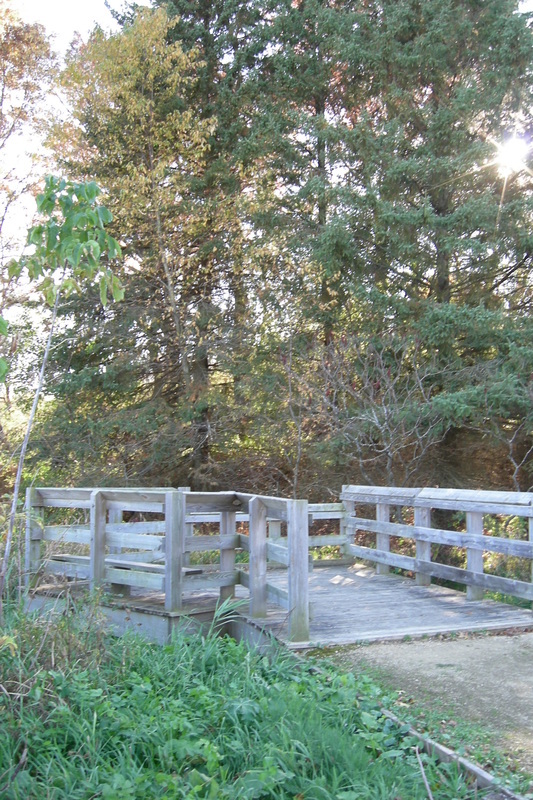 East of Fitchburg, the Military Ridge State Park Trail connects with the Capital City State Trail and the Badger State Trail. This beautiful section of the trail traverses the lowest elevation of the trail, 930 feet, and winds through the Sugar River Valley, crossing the Sugar River several times and wandering through lovely wooded areas, and spectacular wetlands and prairies. Users will find cranes, egrets, hawks, wetland and prairie plants. Further to the west this section of trail passes rolling hills and several picturesque horse farms. This stretch of trail also winds through wetlands with a remarkable display of wildflowers and wildlife. Just past the 10-mile mark a boardwalk leads to a marsh teeming with wildlife. Look for sandhill cranes and other wetland birds. This trail section crosses the Sugar River several times and winds around scenic craggy rock outcroppings. Just east of Klevenville are prairie remnants on both sides of the trail. This beautiful stretch of the trails traverses lowland woods and has several bridges that cross streams feeding into the Sugar River. 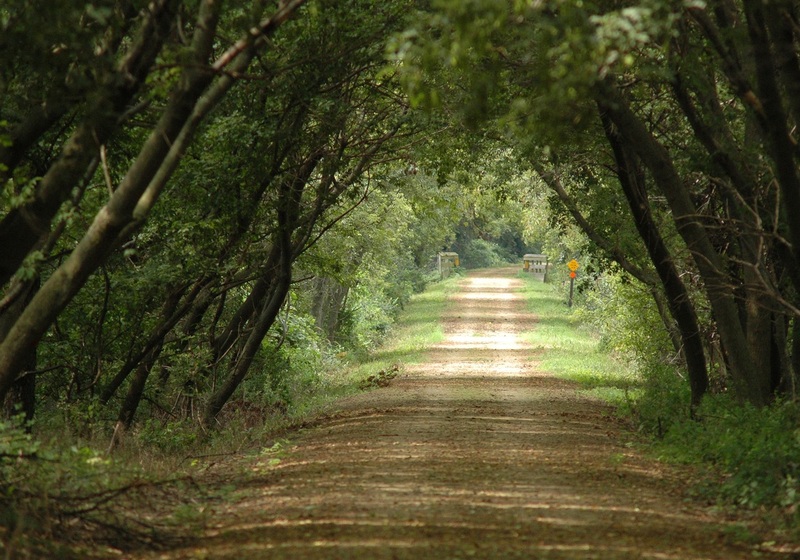 The trail passes through wooded areas and gradually rises through woodlands, farms, and rural suburbs to the small town of Mt Horeb. From Mount Horeb the trail follows the top of Military Ridge. The first few miles of this section closely parallel Highway 18-151. Closer to the town of Blue Mounds the trail passes through woodlands and farms. Just east of Blue Mounds lies the Cave of the Mounds, a remarkable limestone cave featuring colorful stalactites, stalagmites, columns and other formations and open for guided tours most days of the year. The turn off to the Cave of the Mounds is right where the trail tunnels under County Highway ID. The main part of the village of Blue Mounds is just one block south of the trail. Leaving the tiny village of Blue Mounds the trail skirts the south border of Blue Mounds State Park. This is the highest point on the trail rising 1,300 feet above sea level. A spur trail on the right, just past the village of Blue Mounds leads to Blue Mounds State Park. This section of trail includes a lovely stretch of woodlands and farm land. ​Shortly after Barneveld, and for most of the way to Ridgeway, tidy dairy farms and Holstein cows pattern the sloping fields in the distance. The trail feels tranquil here and is often sheltered by a dense tree canopy that is cool and refreshing in the high summer. After curving through miles of lush farmland, you will enter the pleasant town of Ridgeway, home to a railroad depot, built in 1913 and restored after 2000 by the Friends of MRT who continue to maintain it . See calendar of events for open depot dates. A nearby community park has restrooms, parking and a drinking fountain. This stretch of trail meanders through farmland and woods. From the elevated vantage point of the Military Ridge many sections of the trail afford a stunning view of the the Wisconsin River watershed to the north and the Pecatonica and Rock River watersheds to the south. The trail ends in Dodgeville on County Highway YZ about 0.25 miles east of Highway 23. A highlight of this stretch is the Wisconsin DNR Ridgeway Pine Relict State Natural Area which can be accessed by bikers from Highway H just North of Ridgeway. Turn North from the bike trail at County Highway H on the East edge of Ridgeway and head 1/4 mile North. The Ridgeway Pine Relict SNA sign on your left and an info box give advice on hiking and the Great Blue Heron rookery. Ridges of tall pine relict are set in sandstone cliffs and rock walls that soar over wetlands, oak savannas and restored prairies. 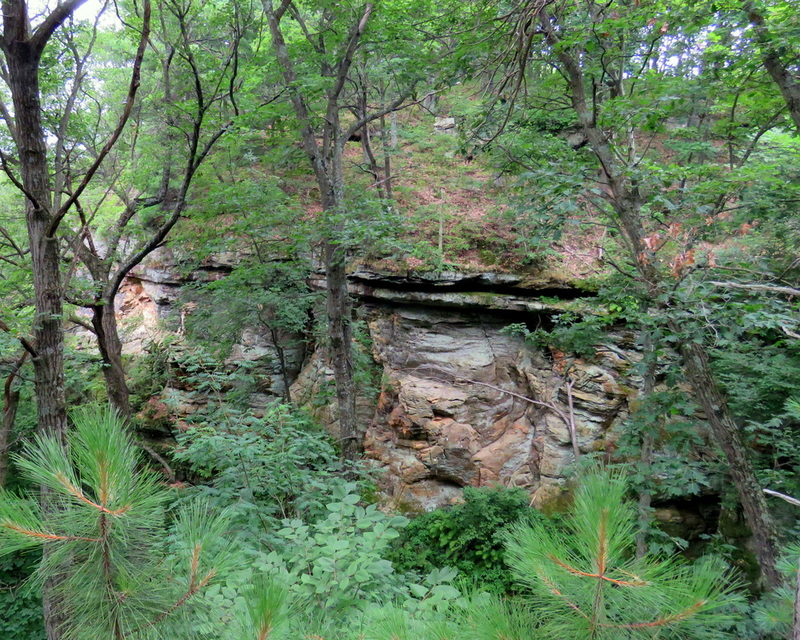 Pine relict are descendants of pine forests that covered all of WI after the ice age. Protected from prairie fires by unglaciated rocky terrain, these alpine communities survived with both Northern and Southern plant species. A spur has been added to the trail that takes you into Gov, Dodge State Park.